The 10 Best Places for Bubble Tea in Oklahoma! Bubble tea, also called boba tea or pearl milk tea, is an Asian drink made with chewy tapioca balls. Popular varieties include green tea and black tea, made with small tapioca pearls and condensed milk. Although early varieties included hot tea, today, it’s more likely to be served cold. And in Oklahoma, there are plenty of great places to find it. For wonderful blends and good service, here are the 10 best places for bubble tea in the state. Create your own special bubble tea by choosing the base, flavor and add-ons, which include boba and fruit jelly. This little shop is easy to find when you take the Garth Brooks Boulevard exit off I-40. Grab a bit to eat while you’re there. Tulsa graduates opened this bubble tea shop because they loved boba and Tulsa. It’s considered to be the original place in T-town to get this specialty drink. Café Bella is an independent coffee and tea bar. Their online menu doesn’t do their drink menu justice, as they make over 200 different blends using high-quality ingredients. Babble OKC offers a BYOB—Build Your Own Boba—drink bar. Choose the 16 or 24-ounce size. Then add your own sinkers or toppings to the cup. Add the amount of ice you want, pick your favorite drink (or even multiple drinks), then bring it to the main counter. This small café in south OKC gets good reviews on Facebook and Google. It’s a fairly new store. Watch its Facebook page for great deals and specials. Koala Tea recommends 17 liters of bubble tea each day. This is one store that features baby boba and honey boba, so if you prefer smaller bubbles in your tea, you have that option. Ask about the popping boba for a special treat. The idea behind Pop In Boba Tea was to give a healthy environment for kids to hang out. Choose a non-caffeinated fruit tea, black, green or oolong tea as a base for your bubble tea, then add in boba or other jellies to get the drink you want. Although this restaurant is known for its upscale ramen and bahn mi, it features some interesting flavors of boba tea, such as white peach, blackberry mint, and passionfruit. Stop in when you’re hungry to really appreciate the menu. 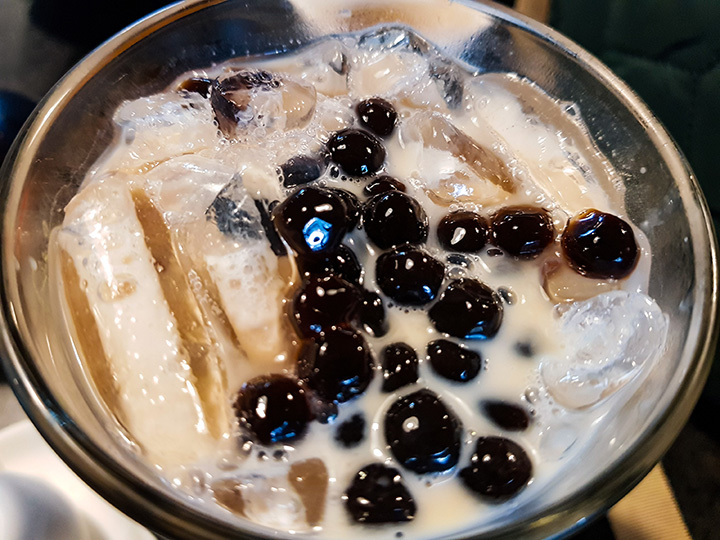 One reviewer suggests getting boba tea at this Korean fusion restaurant, to enjoy traditional flavors of Korea or some interesting twists on American/Korean dishes. Gogi Gui offers unique flavors that you may not see anywhere else, such as durian and jack fruit, two fruits that aren’t seen locally very often. Get boba tea at this Chinese café that serves the college students of Stillwater. Choose black tapioca pearls for a dark contrast to your drink or get unique cube-shaped jellies that offer more color variety.